EDF Climate Corps fellows are designing clean energy solutions that reduce pollution and save money across the country. 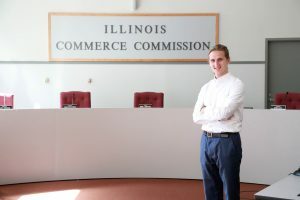 And at my summer fellowship with Environmental Defense Fund’s (EDF) Midwest clean energy team as a part of the Illinois Clean Jobs Coalition, I pursued ways to make clean energy benefit more than just one bottom line. My work resulted from the Future Energy Jobs Act, a monumental piece of bipartisan legislation that aims to transform Illinois’ clean energy economy and “benefit all citizens of the State, including low-income [communities].” Those lofty goals were enshrined in law in December 2016, the result of hard work and negotiation from the Clean Jobs Coalition, a group of more than 200 environmental, business, and faith organizations dedicated to promoting clean energy in the state. The energy landscape is changing in Illinois, and – if the Future Energy Jobs Act achieves what it set out to do – the future will be brighter for everyone. Here’s how. The Future Energy Jobs Act went into effect on June 1, 2017 – my first day on the job. I’m at my most comfortable knee-deep in a financial spreadsheet, so this was my first foray into crafting clean energy policy. At EDF, it isn’t just about ensuring a project has a good return on investment; it’s about making sure those returns benefit everyone. That means moving from financial problems to human problems, and translating the goals of the legislation into effective real-world programs. It’s about making sure those returns benefit everyone. Turning the policy into reality lies with just two public entities. The Illinois Power Agency is tasked with designing and administering the programs, but only once it has approval from the 5 governor-appointed members of the Illinois Commerce Commission. Throughout the design and approval process, both organizations solicit public comments, information, and proposals – and that’s where EDF and the Clean Jobs Coalition come in. We work on behalf of the environmental, business, faith, and environmental justice communities by submitting comments and making proposals that advocate for cleaner, smarter, and more equitable energy decisions. Community solar: Community solar allows people who can’t or don’t want to install solar panels on their roofs – like tenants – to “subscribe” to a solar project at a local church, school, or business. Illinois will have incentives to drive new community solar projects, unlocking the benefits of solar energy to the 49 percent of households who aren’t able to install systems onto their own rooftops. EDF is proposing an innovative and flexible approach that supports solar projects of all sizes and locations, and ensures all households and small businesses have access to them. Job training: Renewable energy is a major engine for U.S. job creation and economic growth that continues to provide local, well-paying jobs across the country. 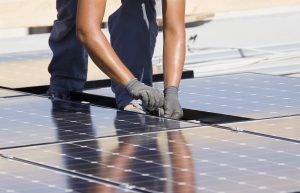 A new utility jobs program will “establish a pool of trained [solar] installers across the state,” providing training and employment opportunities across Illinois, including to foster care alumni and citizens returning from incarceration. As a Clean Jobs Coalition member, EDF is at the table, connecting the dots between community groups and renewable energy industry leaders to train people for 21st century energy jobs. Curbing local air pollution: The Illinois Power Agency is directed to “maximize the health and welfare of its residents” by reducing local air pollutants that come from burning coal, like sulfur dioxide and particulate matter. In a state where 38 percent of electricity comes from coal, increasing renewable energy will likely reduce reliance on coal-fired plants, bringing cleaner air and healthier lives to Illinoisans. EDF recommends compensating renewable energy projects for their environmental health benefits and prioritizing projects in the communities hit hardest by pollutants. Illinois is already starting to see the Future Energy Jobs Act come to life. After a U.S. district court decision upheld the policy’s authority earlier this summer, August saw the Illinois Power Agency release their new electricity procurement plan and local utility Commonwealth Edison unveil their job training implementation plan. And there’s a lot more work ahead. As my EDF Climate Corps fellowship and time with inspiring colleagues ends, I’m confident that the movement toward inclusive, clean energy embraces some of the best and brightest in the Midwest. I look forward to seeing how diverse stakeholders and innovative policy help Illinois justly transition toward the clean energy economy. This entry was posted in EDF Climate Corps, Energy Equity, Illinois. Bookmark the permalink. Both comments and trackbacks are currently closed.